Whether you’re new to working out or have been doing it for years at some point you’ll realize that having a home gym makes sense. You’ll save time, money and join millions of other home gym users. After extensive testing I’ve come to the conclusion that a Body Solid Home Gym is one of the best choices you can make. In fact I would go as far as to say that the StrengthTech EXM2500S is the best choice for your money. There’s an excellent reason for this. Your Body Solid Gym might not be the cheapest option on the market but it does have a reputation for being durable and versatile. EXM3000LPS Double Stack has 4 stars on Amazon. StrengthTech EXM2500S has 4.4 stars on Amazon. Body Solid EXM1500S gets 3.4 stars on Amazon. Body Solid G6B G-Series Bi-Angular Home Gym gets 5 stars on Amazon. Has two 210 pound stacks. Multi-press station, perfect pec, ab crunch, mid pulley, lat pulldown, seated row, leg extension and leg curl. Measures 73 x 83 x 91 (WxHxD). One of the best things about this home gym is that it can be used by two people at the same time. This can make your workout more fun or more competitive; forcing you to work harder. You can also add a VKR30 to allow a third user on your home gym! As shown above you can do virtually any exercise on this machine and work on any part of your body. It is truly a versatile machine! There are 7 different workout stations on one machine. The footprint of this machine is 8 x 10 feet; you’re going to need a fair bit of space to incorporate this machine. You also don’t want to move it once it’s set up! The instructions are mainly diagrams and can be difficult to follow. Add to this the size and complexity of this home gym and you’ll find it takes you at least 10 hours to get the gym put together! This is definitely one of the more expensive options when looking at a home gym. In my opinion it is an excellent product for anyone looking to improve their current routine. It offers an impressive array of exercise options; providing you have the space. 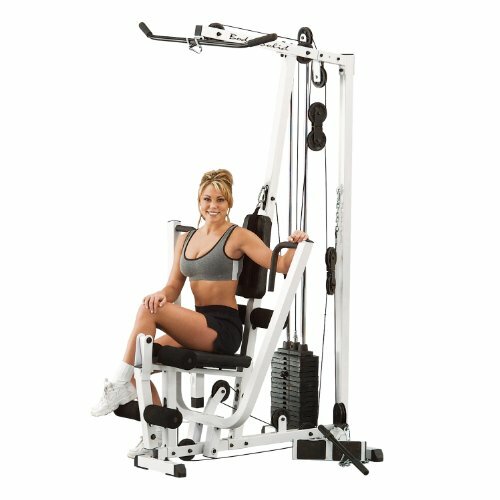 Designed for chest press, perfect pec, leg extension, leg curl, lat pull down, ab crunch and seated row. The Body Solid EXM2500S has a rating of 4.4 stars on Amazon. More impressive is the lack of negative comments. There are no 1 star reviews and just two 2 star reviews; which have issues with the construction time and leg exercises available. Although you won’t get as many functions as the EXM3000LPS you will have plenty enough to complete a full body workout. What is really impressive is that this Body Solid home gym still offers 3 distinctively different workout stations. This will ensure you are in the right position and working the right muscles every time. This is where the EXM2500S really comes into its own. At less than half the price of the EXM3000LPS it is much more affordable. This puts it in direct competition with a variety of other home gyms. But, the fact that it has the 3 workout stations lifts it above the competition. The EXM2500S is a well built piece of kit. Once set up its sturdy and capable of handling anything you throw at it. Alongside this you’ll appreciate the fact that it comes with a lifetime warranty. This should give you some peace of mind! The 210lb weight stack is good for many people but it won’t be enough for everyone. Unfortunately there is no easy option to increase this. However, if you think more weight is going to be necessary then you can expect to almost double the price. Although the EXM2500S offers a good range of exercises the leg options are contained to curls and extensions. If you’re really looking to boost your muscles all over you may wish to consider a home gym that gives a few more options in this area. Finally, as with the EXM3000LPS, the instructions mainly consist of images. You will need patience and plenty of time to build this Body Solid home gym. Of course, in my opinion its worth this small inconvenience; once its set up you can use it whenever you want. 160lb weight stack – adjustable by 10lbs via pin. Chest press, lat pulldown, ab crunch, leg extension, leg curl, seated row. The Body Solid EXM1500S gets a 3.4 star rating on Amazon although the majority of the reviews are 4 and 5 star! The poor reviews actually focus on the returns policy and issues with customer service; not the actual working of this home gym. You’ll need very little space to setup the Body Solid EXM1500S. This is extremely beneficial when you don’t have much spare room or if you’re just starting out. In fact you could describe this as the perfect starting out home gym. Impressively the Body Solid EXM1500S actually has 2 workstations. 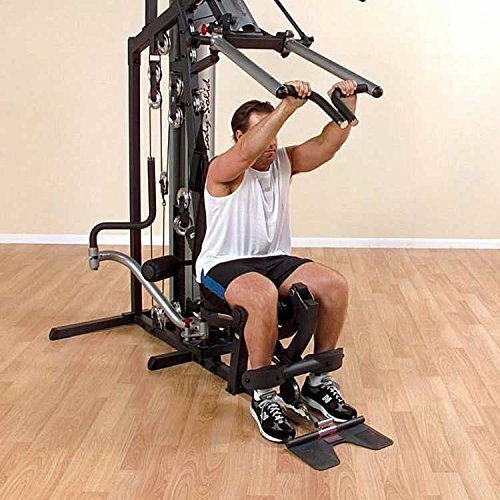 The second is designed for rows and bicep curls while the main station handles the chest and leg. It is easy to switch between exercises and you’ll get a full body workout in the process. The lifetime warranty covers the frame, welds, cables, pulleys, bearings, hardware, plates and even the guide rods. That’s pretty impressive. You should be able to purchase this product for less than 4 figures which makes it an attractive option. Especially if you are new to home gyms. Several customers have had an issue with returning it. Whether you’ll struggle to unload it from the truck or simply don’t like it you might find that by the time you’ve put it together you’re past your return period. The fact that the cost of returning is significant will probably prevent you from doing so. The machine comes with 160lbs of weight. This is enough to get you started but you might want more in the future. You can’t upgrade the weight stack on this machine. For a little more money the EXM2500S represents bretter value long term. In common with the other Body Solid gyms listed many customers have commented the instructions could be better. You will need patience and time to set this up. With just 5 reviews it’s hard to be definitive about the results. But the fact that every one of the customers gave it 5 stars has to count for something! Bi-angular press station replicates free dumbbell press. Features chest, incline, shoulder press & leg developing stations. 210lb Stack – can be upgraded to 260lb. Most users will find the 210lb sufficient but it is possible to upgrade this as you grow. The fact that this can be adjusted according to your needs is a valuable and essential part of the machine. This unique design allows perfect upper body workouts. This will help to ensure you complete all the exercises properly. As with most Solid Body products, the Body Solid G6B comes with a lifetime warranty. This helps to justify the price and ensures you never have to buy another piece of exercise equipment again. The Body Solid G6B is exceptionally well put together. The design is sturdy and the cables are designed to last. It’s unlikely you’ll have any issues with it. With a relatively small footprint and several different stations it’s not surprising to find that some bits of equipment are on the way when exercising. This isn’t enough to stop you completing the exercise but may be frustrating. Body Solid claims there are 50 exercises which can be performed on the Body Solid G6B. However, they don’t include what they are and don’t actually seem to be capable of telling you. This claim seems a little high. Again the G6B is going to take you between 8 and 15 hours to construct. This is a labor of love which would be made easier with better instructions. As noted, there is not currently an exercise guide included with the machine. This would be helpful in a machine which is designed to do so much! The G6B is a great machine but it’s not as versatile as the EXM3000LPS, although a similar price. It’s a good option if you’re looking to lift the extra weight. 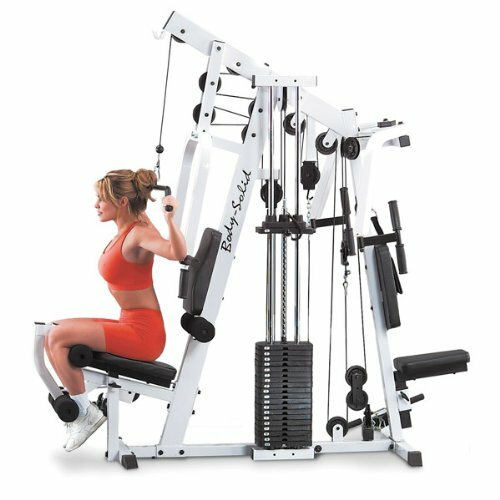 It’s clear that Solid Body home gyms have a reputation for quality and they all come with lifetime warranties. There is no doubt in my mind that they are some of the best home gyms on the market. But the pick of the bunch, for versatility and price has to be the EXM2500S; you’ll find it hard to beat.